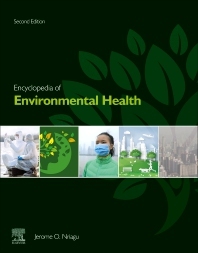 Encyclopedia of Environmental Health, Second Edition presents the newest release in this fundamental reference that updates and broadens the umbrella of environmental health— especially social and environmental health—for its readers. There is ongoing revolution in governance, policies and intervention strategies aimed at evolving changes in health disparities, disease burden, trans-boundary transport and health hazards. This new edition reflects these realities, mapping new directions in the field that include how to minimize threats and develop new scientific paradigms that address emerging local, national and global environmental concerns. Prof. Nriagu was the Editor-in-Chief of the first edition of this encyclopedia. He was the Editor of Science of the Total Environment for more than 25 years, Founding Editor of Global Health Perspectives and has served on the editorial boards of many other journals. He taught global environmental health for years and has conducted research in many foreign countries including India, Mongolia, Qatar, Jordan, Nigeria, Ghana, South Africa, Zambia, Jamaica and Brazil. He has served as scientific advisor to many agencies and international organizations including the World Bank, World Health Organization, United Nations University, US Environmental Protection Agency, Alberta Ministry of the Environment, International Center for Environmental and Nuclear Sciences (Jamaican government), etc. His accolades include Alexander van Humboldt Distinguished Research Award, Honorary Doctor of Science degree (University of Alberta, Canada) and he is a Fellow of the Royal Society of Canada. Dr. Nriagu was on the faculty and Director of the environmental health program in the Department of Environmental Health Sciences, School of Public Health, University of Michigan for over 20 years. Before that he was senior Research Scientist with Environment Canada and an Adjunct Professor at the University of Waterloo. He is currently Professor Emeritus, School of Public Health and Research Professor Emeritus, Center for Human Growth & Development, University of Michigan.